"Fairfax Fresh" 16" x 20" o/c. 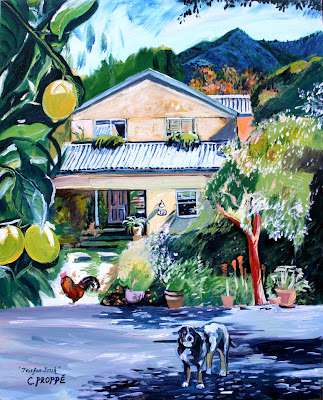 View of Patti Elliot's Home and Organic Meyer Lemon Farm overlooking Mt. Tamalpais, Fairfax, CA. This is the second session, painting from composited images on top of my plein air work from yesterday. I am happy with the way it came together. The photo of the lemons and the rooster I used for reference were taken from my first day visiting the farm, so this is a piece that took 3 days of work to complete. My partner came up with a great quote regarding my paintings..."A Proppé is not done in a day." I think he is correct.. I usually take about 3 sessions to finish my canvases, regardless of their size.